Why Morgan Freeman and all those stars who complain should get over it! When did Morgan Freeman became famous(sic)is a term often searched for when the actor is being looked for on the net.The nutcracker with Michael Caine is one of his latest ventures. Now i like the man,he is one of my favourite actors,but it really winds me up when famous people complain about fame and how they wish they were not famous blah blah blah..Absolute b#llocks! As if they did not know what the game entailed when they embarked on the journey. biggest actors and you say you will kill just to be nominated for an oscar and your life ambition is to win one. Surely you are not daft enough to think you are gonna achieve all these without losing your anonimity do you?You know you are gonna be famous,you know your life will never be the same and you know it will now be private jets and living in million dollar mansions and getting all the perks of fame. So how come you don't complain about all those other things but complain about losing your privacy? There is a saying in Africa that says "if you don't want to get wet,don't go by the sea side. So hearing Morgan,who i like a lot complain about his privacy blah blah here just brings it all back to me.Gert over it dude,it could be a lot worse,and if you really hate it that much,just stop acting! You will be surprised at how quickly they forget about you and move on to to net thing. 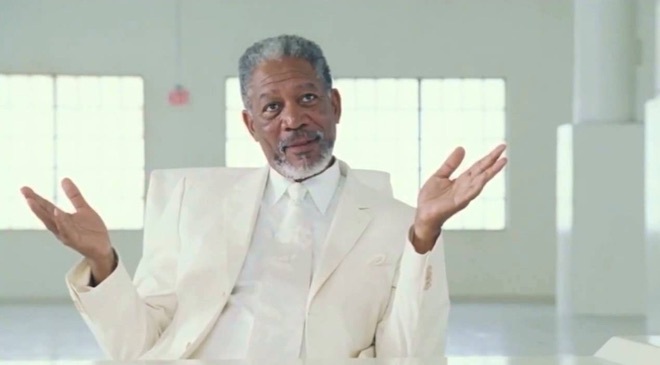 Morgan Freeman says becoming a star was a "mistake" because he can't ever "disappear". The Hollywood legend will turn 80 in June, and while he has a big enough bank balance to happily retire, he doesn't want to give up acting. Although he has gotten used to being spotted in public, the 'Shawshank Redemption' actor admits it was always a "big risk" getting into the business because of the loss of anonymity. Speaking to Britain's The I Paper, he admitted: "Becoming an actor is a big risk. I don't get what your reasons for doing it; you're gonna have to step off the cliff. And timing is everything - where you are and when. There were times I feared I'd be an old man and never have got to do what I wanted. I just couldn't get arrested when I was a younger man, and now I've reached retirement age, it seems Hollywood won't let me retire. "Of course, I can afford to retire but now I do it for the fun. As I started to move as an actor, at some point I got to a place where I knew that becoming an actor was a mistake, because you can't ever disappear." Freeman doesn't get pestered for selfies in his hometown of Charleston, Mississippi, but everywhere else he is asked for photos constantly and he will often decline, unless it is a " very pretty woman". On the annoyance of selfies, he said: "Everyone wants you to stop whatever you're doing and have a selfie. They'll even ask you on the elevator, 'Oh hi, Do you mind?' I do mind." One place where he particularly hates getting asked for a selfie is in the gym at hotels. He moaned: "I can't even go to a nice hotel gym because everyone goes, 'Oh my god', and gets the cameras out. Nobody is without their camera. I even seen homeless guys with their cameras." On his only exception he added that he will take a photo "if it's a really, really pretty woman."